The following delivery and payment conditions apply to all of our deliveries and services. All rights, obligations, quotes, orders and agreements to which these general terms and conditions apply, as well as these conditions, are exclusively governed by Dutch law. All prices are in euro, including 21% VAT and shipping costs. We charge shipping fees on label orders. For delivery within Belgium and Netherlands, the shipping costs are â‚¬16/shipment, excluding VAT and for the other countries €42.50/shipment excluding VAT (regardless of the number of packages per shipment). We will ship your order as a package. You cannot add more packages after placing your order. Shipment is handled by GLS in NL/Belgium; and by TNT in other countries. After placing your order, you will receive an order confirmation via e-mail with an overview and an order number. Orders will only be delivered after receipt of payment. You can pay online directly using iDEAL, PayPal, or with Visa/Mastercard. All items will be transferred to GLS within 7 working days after receipt of the approved payment. You will receive a shipment confirmation via e-mail that will include a track-and-trace code. Van Engelen & Evers b.v. is not liable for exceeding the stated delivery times or loss and/or damage by GLS. If you're not satisfied, we'll fix it! We like to have satisfied customers and treat your labels with the utmost care. If you are not satisfied with the final result, let us know within 3 business days after receipt by e-mail or by telephone. Together we'll discuss how we can solve your issue quickly and completely. 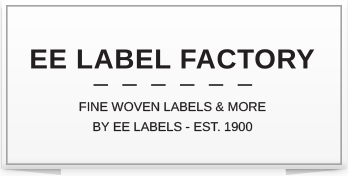 Send your labels back within 5 business days of receipt so that we can start work on your new order. We make a sample for your approval. Van Engelen & Evers b.v. is not liable for damage that may have resulted from the use of the products we've delivered. Van Engelen & Evers b.v. shall not be liable for any damage, either physical, material, or immaterial, resulting from misuse of the products we sell. Van Engelen & Evers b.v. shall not be liable for damage to items caused during the stitching process. The content of this site has been composed with care. Van Engelen & Evers b.v. however, cannot guarantee that certain information is not incorrect and/or incomplete. Van Engelen & Evers b.v. is not liable for the consequences of incorrect or incomplete information on their website. Van Engelen & Evers b.v. cannot be held responsible for colour deviations resulting from display quality. Van Engelen & Evers b.v. is not liable for any consequences of delayed order delivery. Van Engelen & Evers b.v. aims to have satisfied customers. If you have any questions, comments, or suggestions, we'll be happy to discuss them with you. Complaints must be sent by registered mail (so you send the shipment to be checked), within 5 working days after receiving the products. All rights reserved. Nothing from this website may be copied, stored or distributed without written permission from Van Engelen & Evers b.v.